LAST week we went to Dzapasi to try and re-construct the story of the assembly point that was once there. Almost all the reporters in the newsroom at our workplace did not know what assembly points were and I was surprised. This has been our persistent call; guarding against the danger of forgetting our past and who we are because outsiders, especially our former colonisers, will use it to further their imperialist agenda. Assembly points were a critical transitional mechanism from war to peace agreed to at the Lancaster House Conference in 1979. They were the designated points where guerillas operating in the country would gather with their arms, leading to the elections in March 1980. British Foreign Secretary Lord Carrington who chaired the negotiations admitted assembly points were a tricky proposal that would determine the success or failure of the agreement and he didn’t know whether it would work. Commissioner General Zimondi’s sentiments embodied the fear and doubt all sides held about the agreement. There were 21 assembly points around the country for both ZANLA and ZIPRA and Dzapasi, or Foxtrot as it was called in the agreement, was located 60km south of Murambinda in Buhera. It spread over 20km and had an estimated population of 15 000. It was probably the biggest assembly point. The Commonwealth Monitoring Force contingent overseeing the ceasefire was positioned at Dzapasi Primary School inside the assembly point. As we drove through the various bases that constituted the assembly point, there was very little physical evidence left, only mounds of earth to show the intricate maze of trenches and of course, the people’s memories. Trenches were an interesting addition to the war. When we did our military training in Tanzania in 1975, there was no mention of the trench as a component of fighting the war. At Dzapasi, the trenches were an indication the nationalist war was developing from a guerilla into a conventional war. According to a war veteran who trained at Nachingwea in Tanzania in 1978, their punchline was; dig or die. They had given us a rousing welcome at Dzapasi. Sabhuku Makuvise or Dzapasi led the delegation from the villages. It included the local councillor and war veterans who had stayed at the assembly point. They could not believe we had come to listen to their memories. At Base Three behind the mountain, there was a broken patchwork of stones that our guide said was a map of Zimbabwe. He said during the days of the assembly point, the map had the names of all the major towns of Zimbabwe and the roads that connected them, down to the names of the suburbs in the towns. Although it was difficult to visualise how all that fitted in the crude map, there was an overwhelming sense of homecoming about it, a courageous attempt to prepare oneself for the reunions with one’s family. And then there was an unmarked grave next to the place they held their morning parade. We were told a young man was accidentally shot in the euphoric shooting to mark independence on April 18: so, so close, and yet so, so far away. The women occupied Base Two at the foot of the mountain near the iconic Dzapasi spring that provided water to the surrounding villages. It has since dried up. They said it dried up shortly after the assembly point was shut down and the villagers we spoke to admitted with stoicism their biggest challenge now was water for their livestock. One man lined up for the visit, a war veteran assembled here that time, recalled how they refused to be paid because they argued they had not fought for monetary gain but for the freedom of their people. He shook his head in disbelief and laughed. It is painful memories of such a colossal commitment that Dzapasi still holds. If we had ridden off on the momentum of that commitment at independence in 1980, we would not have leaders gleefully cashing in on the suffering of the majority now. The villagers at Dzapasi were resigned their story had been forgotten. That is why they were surprised we had come all the way from Harare to listen to their memories. Because the assembly point sprawled over such a large area, it swallowed entire villages. The villagers talked about erratic food supplies to the assembly point at the beginning and how they stepped in and fed the thousands of guerillas from their limited stocks. “It’s not that we want to be compensated,” a villager added quickly. And much later, there was the challenge of looking after the children born to the girls after the assembly point was closed, another villager chuckled as if time had resolved the problem. A war veteran put the same case differently. He talked about the difficult they faced to save many villagers’ marriages because the women wanted to run away to them. “We were the craze of the moment!” he said. A war veteran now working at the district council at Murambinda told us how he hid from his parents several times when they came looking for him at the assembly point. He confesses he doesn’t know why he was doing it. And when he finally gathered enough courage to meet them, his mother burst into tears when she saw him and people around asked her if she had not found her son and she said no, pointing at him and they admonished her saying she was mocking those who had lost theirs. I remember my friend David Chitsora, the one I went to the war with and the hard time I faced when we came back. I didn’t know how to tell his parents he had died in Zaka during the war. So I avoided going to their home in Highfield in case I met them. But somehow, they got wind I had returned and the sisters came looking for me; Jesus, how they had grown! They were toddlers when we went to war six years before. I lied to them David had gone to Yugoslavia for some specialised training. They came back a week later to get details about the training programme. And once again, I lied I would find out and furnish them the details. But when it was the mother and the father who eventually turned up for the supposed details immediately after, I felt trapped. It must have been how I avoided their eyes that they knew. I didn’t know what to do. “We are lucky we didn’t lose both of you,” David’s mother whispered. Something inside me collapsed and I fell into her arms and wept like a little child. “There are others who lost their whole families,” she continued. David’s father stood close by in total silence, his arms folded across his chest. My friend was their only son. Then the villagers told us the population at Dzapasi began to dwindle. The war veterans explained the occupants were being incorporated into the newly formed Zimbabwe National Army and other security services departments such as the Police and the Prison Services. 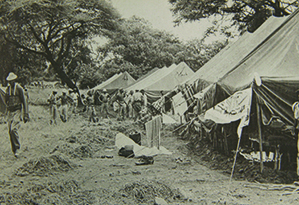 Others opted for voluntary demobilisation and went back home to civilian life. The story of Dzapasi represents others at other assembly points who got lost in the noise and excitement of the celebrations for independence. All sides were apprehensive the delicate experiment might not work, but it worked. The tragedy is if the story is not documented, the villagers and those who were assembled there will eventually die with their memories. And so too, will the story of Dzapasi. We will not allow it to die. Next articleAre blacks capable of passing on family business? Dzapasi cannot be 60km south of Murambinda. Masasa Shopping Centre, further south of Dzapasi is at the 47km peg along the Murambinda-Birchenough Road. ^0km south of Murambinda gets us to Mozokomba, well after Dzapasi or Chiurwi now. Thank you so very much for writing about the story of my people and area. Such a good piece. I can now visualize Echoing Silences.